Start off your visit on the 19th (Sun): let little ones run wild at Ohori Park, take in panoramic vistas at Fukuoka Tower, then take in the spiritual surroundings of Dazaifu Temmangu, then take in the spiritual surroundings of Kushida Shrine, and finally browse the different shops at Tenjin Underground Shopping Center. Get ready for a full day of sightseeing on the next day: explore the world behind art at Fukuoka Asian Art Museum, admire the striking features of Hakata Station, and then admire all the interesting features of Fukuoka Yahuoku! Dome. To find maps, ratings, more things to do, and more tourist information, refer to the Fukuoka road trip tool . Singapore, Singapore to Fukuoka is an approximately 9-hour flight. You can also do a combination of flight and train. The time zone changes from Singapore Time (SGT) to Japan Standard Time (JST), which is usually a 1 hour difference. Expect little chillier temperatures when traveling from Singapore in May; daily highs in Fukuoka reach 28°C and lows reach 18°C. Finish up your sightseeing early on the 20th (Mon) so you can go by car to Sasebo. Kick off your visit on the 21st (Tue): find something for the whole family at Huis Ten Bosch. To find traveler tips, where to stay, and other tourist information, read Sasebo trip itinerary planner. You can drive from Fukuoka to Sasebo in 2 hours. Other options are to take a train; or take a bus. May in Sasebo sees daily highs of 28°C and lows of 19°C at night. Wrap up your sightseeing on the 21st (Tue) early enough to drive to Nagasaki. Kick off your visit on the 22nd (Wed): take your sightseeing to a higher altitude at Mt. Inasa, steep yourself in history at Nagasaki Peace Park, take an in-depth tour of Nagasaki Atomic Bomb Museum, then see the interesting displays at Nagasaki Peace Memorial Hall for the Atomic Bomb Victims, and finally snap pictures at Megane Bridge. On the 23rd (Thu), you'll have a packed day of sightseeing: examine the collection at Dejima, then contemplate the long history of Glover Garden, then head off the coast to Hashima Island, and finally take in the architecture and atmosphere at Catholic Church Hongouchi. To see photos, reviews, where to stay, and other tourist information, read our Nagasaki journey builder . Drive from Sasebo to Nagasaki in 1.5 hours. Alternatively, you can take a train; or take a bus. In May, plan for daily highs up to 28°C, and evening lows to 19°C. Finish your sightseeing early on the 23rd (Thu) so you can travel to Kumamoto. 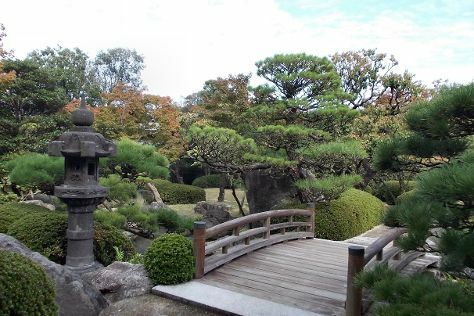 Start off your visit on the 24th (Fri): don't miss a visit to Sakuranobaba Josaien, admire the natural beauty at Suizenji Jojuen Garden, then explore the world behind art at Contemporary Art Museum, Kumamoto, then step into the grandiose world of Kumamoto Castle, and finally contemplate in the serene atmosphere at Kato Shrine. For reviews, where to stay, other places to visit, and tourist information, read our Kumamoto holiday planner . Do a combination of car and ferry from Nagasaki to Kumamoto in 2.5 hours. Alternatively, you can take a train; or take a bus. Expect a daytime high around 29°C in May, and nighttime lows around 17°C. Finish your sightseeing early on the 24th (Fri) to allow enough time to take a train to Kagoshima. Kagoshima sits across the bay from Sakurajima, an active volcano that serves as a symbol of the city and works its way into many aspects of life here. Kick off your visit on the 25th (Sat): explore the world behind art at Nagashima Museum and then get impressive views of Sakurajima. For traveler tips, where to stay, ratings, and tourist information, read our Kagoshima vacation maker website . Traveling by train from Kumamoto to Kagoshima takes an hour. Alternatively, you can drive; or take a bus. In May, plan for daily highs up to 28°C, and evening lows to 17°C. Wrap up your sightseeing by early afternoon on the 26th (Sun) to allow time for travel back home.